Sky Vegas brings the thrill of Vegas to your screen, tablet and phone. During 18-months contracting at Sky Betting & Gaming in Leeds as a copywriter within the creative department, I was involved in the execution of numerous promotions. 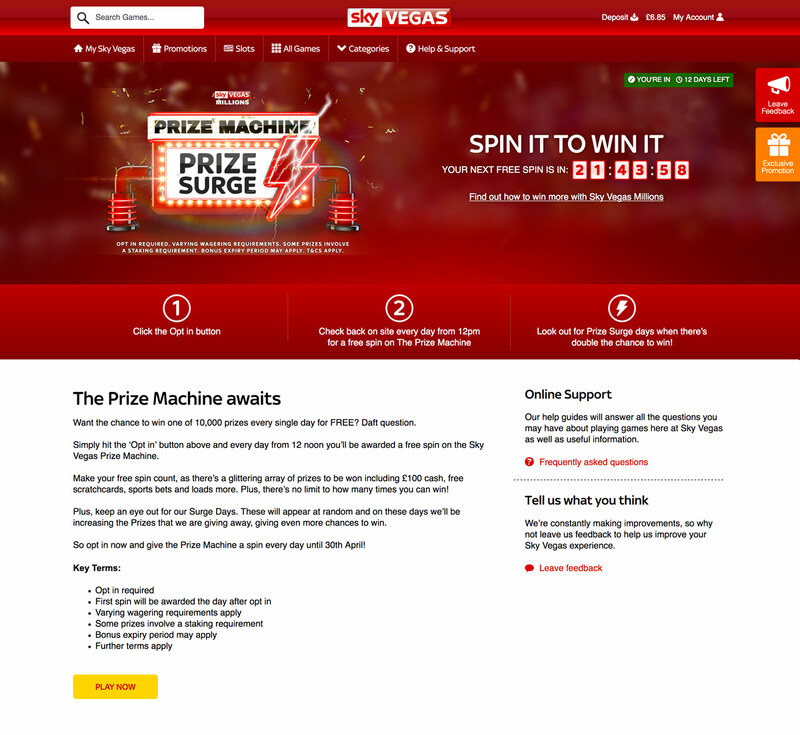 One of the largest and highest profile was Sky Vegas Millions – a multi-million pound promotion. The Prize Machine gave away hundreds of thousands of prizes and the impactful concept ‘Spin it to win it’ immediately communicates the excitement and exactly what players need to do to take part. Spin it to win it. Want the chance to win one of 10,000 prizes every single day for FREE? Daft question. Simply hit the ‘Opt in’ button above and every day from 12 noon you’ll be awarded a free spin on the Sky Vegas Prize Machine. Make your free spin count, as there’s a glittering array of prizes to be won including £100 cash, free scratchcards, sports bets and loads more. Plus, there’s no limit to how many times you can win! Plus, keep an eye out for our Surge Days. These will appear at random and on these days we’ll be increasing the Prizes that we are giving away, giving even more chances to win. So opt in now and give the Prize Machine a spin every day until 30th April!